News of the basketball megastar's school opening in his hometown of Akron, Ohio, is certainly heartwarming. The school has an onsite food bank; provides bicycles to every student “to escape dangerous parts of town and explore,” according to its mission statement; and provides job placement assistance for parents. And it's quite clear to me that this wasn't solely a financial investment (I'd rather he get his tax write-off for this then send his money to the state or the feds). But his SJW comments in his promotion of the school are a rehash of the usual hackneyed Democrat talking points, and miss an important point about the context of his school. In addition to telling CNN's Don Lemon the country is headed for "some kind of slavery," James called President Trump a "bum" and jokingly said he would consider running against him in 2020. [post_ads]James is a high-profile political Jekyll and Hyde; he has done a lot for his community, but when he talks politics, I remind myself why 2016 was such a crucial win for we America First voters. When he emotionally outlined his reasons at the school's opening ceremonies for wanting to assist the 240 at-risk and low-income students, I never doubted his sincerity; James himself is not a man who comes from an affluent family. But he's missing the bigger picture here. Unsurprisingly absent in the coverage I read and watched about the school was any discussion whatsoever about why some children in Akron, with a population of 200,000, are at-risk and low-income to begin with. What has happened, and is happening, in Akron that motivated James to spend a reported $8 million for a safe space school? Well, here's what I discovered about Akron: it's run by xenophobic, anti-immigrant, lifelong National Rifle Association members who want to Make America Segregated Again. Just kidding: Akron, like most of America's midsize and large cities with at-risk kids, is run by Democrats. Akron has had only Democrat mayors for the last 13,000 consecutive days. The last time Akron had a Republican mayor, Brian Sipe was the Cleveland Browns' quarterback; if you know who Brian Sipe is, my compliments. The current city council has 14 members, including a clerk; every member is a Democrat. It's not unusual for Democrat cities to have city councils with 80 percent or more Democrats throughout their modern histories; in Akron, I was unable to verify the political parties of members over the last 13,000 consecutive days, although I reckon they weren't GOP xenophobic anti-immigrant, lifelong NRA members who want to Make America Segregated Again. Of the 47,000 families residing in the city, according to the most recent U.S. Census numbers, 26 percent are single-parent households; 20 percent of the families were mother-only. Of all birth ages of mothers, 8 percent are aged 15-19, and 27 percent are aged 20-24. Akron has certainly seen some good times; the city was the rubber manufacturing capital of the world during most of the 20th Century, when Goodrich Corporation, Goodyear Tire and Rubber Company and Firestone Tire and Rubber Company were all headquartered in the city. By 2000, global free trade deals (a bipartisan scourge on our economy) sent the jobs overseas. The city rebounded somewhat, thanks to the University of Akron's innovation in Internet technology development, but Akron never fully recovered from the manufacturing job losses. Akron's eight public high schools are on track this year to graduate 54 percent of their seniors, down from 74 percent last year. An online search of the district's Board of Education members didn't reveal much about their politics, although two of the seven's board members -- Morgan Lasher and Patrick Bravo -- have been involved with the Democratic Party on national and local levels. I found nothing about the political activities of Superintendent David James, who's total compensation and benefits is $244,000 annually. So what we have in Akron is: thousands of single-parent families, particularly fatherless homes; by today's standards, young mothers; the usual public education challenge of low graduation rates found in school districts in Democrat cities; and dangerous crime areas. Calling out those who significantly contributed to the ills that have befallen the I Promise pupils would have been social activism I would have loudly applauded -- James missed a wide-open layup. I suspect, however, that he has zero idea that Democrats have been running Akron for longer than he's been alive. It's too bad he is apparently so ignorant about one of the places he calls home. Imagine if celebrities, athletes and entertainers used their massively influential media platforms to shed a white hot light on the utter, abject failures of Democrat-run cities -- failures that most adversely affect the youth, who suffer from failing schools, rampant crime and lacking economic mobility and opportunity. James believes this to be true about Akron, whether he knows it or not; otherwise, he wouldn't have opened his school. Democrats tend to destroy whatever they touch, and there is no better example of this than the cities they've monopolized for generations upon generations. The ruination of many parts of these Democrat cities is one of the most egregious cover-ups, I believe, in American history. 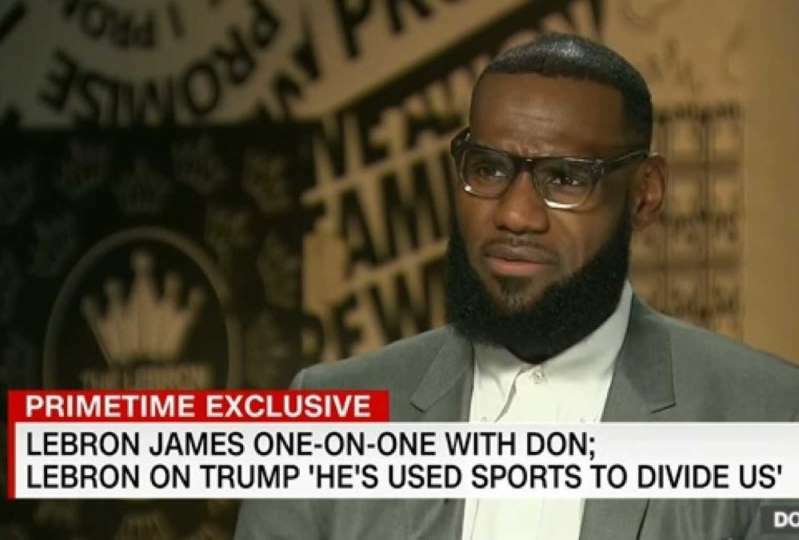 If LeBron James leveraged his status and popularity to attack the true opposition (Democrats), rather than fake outrage opposition (Trump), he'd have my unanimous vote for MVC: Most Valuable Celebrity.